We’d love your help. Let us know what’s wrong with this preview of Wolf Sanctuary by Chuck Rineer. To ask other readers questions about Wolf Sanctuary, please sign up. A short coffee table book containing photographs of the Speedwell Wolf Sanctuary in Pennsylvania. There is very little narrative. I would have liked more because it was interesting to learn more about wolf behaviour. Did you know they can hear for 12 miles and smell for 4-5 miles? Amazing! Some of the photographs are fabulous, particularly of the wolves howling, and the love the photographer has for them shines through. Some are very repetitive though and there’s a fair bit of anthropomorphism g A short coffee table book containing photographs of the Speedwell Wolf Sanctuary in Pennsylvania. There is very little narrative. I would have liked more because it was interesting to learn more about wolf behaviour. Did you know they can hear for 12 miles and smell for 4-5 miles? Amazing! Some of the photographs are fabulous, particularly of the wolves howling, and the love the photographer has for them shines through. Some are very repetitive though and there’s a fair bit of anthropomorphism going on in the narrative. It’s a nice book and I’m sure it will sell well at the sanctuary as a souvenir of a visit. Otherwise, I’m not sure what the market will be. Wolf Sanctuary: The Wolves of Speedwell Forge by Chuck Rineer is a book I requested from NetGalley and the review is voluntary. It is mostly photos of the beautiful creatures, all ages and colors. I enjoy that as much as reading about them if not more. I would have given it a 3 1/2 but they don't give halves out. It was good/average but not overly good. I still enjoyed it but I am sure the photographer had a closer bond with them. If you live in Pennsylvania, you might have heard of Wolf Sanctuary founded and run by the Darlingtons. The Santuacry is a rescue sight for wolves that also educates visitors, though it is wolves first and visitors second. In other words, you need to make a reserveration. Rineer’s book is a photographer’s look at the various packs that reside on the property. It is not a history of the foundation or of the various packs and wolves (though a brief overview is given). What is celebrated in this volume is the beauty of wolves in wonderful, striking photographs. The book includes brief descriptions of the relationships between the wolves as well as some facts. Truthfully, the book’s selling points are the pictures of wolves during wolf things. Like standing and sleeping the snow, playing, sleeping, being pups. Beautiful photographic tribute to the Wolf Sanctuary of PA. Majestic animals. Thanks Chuck!! When I first started I was a bit worried this would contain tons of text. Don’t get me wrong, I love reading (duh), and I love learning ab I received this book from Netgalley in exchange of an honest review! When I first started I was a bit worried this would contain tons of text. Don’t get me wrong, I love reading (duh), and I love learning about wolves, but I mostly wanted this book for the photographs of wolves. :P Sometimes there are days when you just want visual instead of words. A beautifully put together book of photographs of the wolves at the Speedwell Forge Wolf Sanctuary in Pennsylvania. While I do wish there had been a bit more information, whether about wolves in general or the sanctuary itself, the wolves are the stars of the book and Rineer’s photos capture their personalities perfectly. Ranging from gorgeous shots of the wolves playing and lounging in the snow to brief photo arcs of den digging and pup training, this is a perfect coffee table book for anyone wh A beautifully put together book of photographs of the wolves at the Speedwell Forge Wolf Sanctuary in Pennsylvania. While I do wish there had been a bit more information, whether about wolves in general or the sanctuary itself, the wolves are the stars of the book and Rineer’s photos capture their personalities perfectly. Ranging from gorgeous shots of the wolves playing and lounging in the snow to brief photo arcs of den digging and pup training, this is a perfect coffee table book for anyone who loves wolves. Chuck Rinner takes photographs of the packs of wolfs at Speedwell Forge Wolf Sanctuary in Pennsylvania. This is mostly a book of photographs, as we get a bit on information to explain what is going on, but the aim is to just look at the wolves and discover them in their natural habitat. I really enjoyed going through the beautiful pictures. I love wolves, I think they're amazing animals and you really get to see them in their everyday life in Wolf Sanctuary. Although there are wild animals, you ca Chuck Rinner takes photographs of the packs of wolfs at Speedwell Forge Wolf Sanctuary in Pennsylvania. I really enjoyed going through the beautiful pictures. I love wolves, I think they're amazing animals and you really get to see them in their everyday life in Wolf Sanctuary. Although there are wild animals, you can see how they are so far from that image of a monster they have had for centuries. This book is filled with such beautiful photos that Chuck Rineer had taken at Speedwell Forge Wolf Sanctuary for chose to a decade. These images are simply beautiful and it made me fall in love with these wild canine all over again. Rineer did a wonderful job at sharing the characteristics, and personalities of many gorgeous wolves, and I can only imagine how breathtaking they would have been to see in person. I can see this being the perfect coffee table book. A lovely educational piece. I have This book is filled with such beautiful photos that Chuck Rineer had taken at Speedwell Forge Wolf Sanctuary for chose to a decade. These images are simply beautiful and it made me fall in love with these wild canine all over again. Rineer did a wonderful job at sharing the characteristics, and personalities of many gorgeous wolves, and I can only imagine how breathtaking they would have been to see in person. I can see this being the perfect coffee table book. A lovely educational piece. Good balance of photography and short explanation, I imagine this being a decent coffee table book for the wolf or animal lover. A book about wolf obviously, but pretty much just a pictures books because there is very little information in it. Also the pictures, not bad at all, but very common, meaning that they don't look like great photographers pics, just the kind of picture that most people can take if they take the time to. In the end, just not much to it! What a wonderful book. Not only are there photo's of wolves but there is also a lot of information about wolves. The book features The Wolves of Speedwell Forge Wold Sanctuary in Pennsylvania. In 1976 The Darlington family was given a wolf dog. In 1980 the state of Pennsylvania decided that wolves were exotic pets, and that all owners of exotic pets needed a special permit in order to keep their pets. Of course the Darlington's applied for the permit. After receiving the permit to keep their wol What a wonderful book. Not only are there photo's of wolves but there is also a lot of information about wolves. The book features The Wolves of Speedwell Forge Wold Sanctuary in Pennsylvania. In 1976 The Darlington family was given a wolf dog. In 1980 the state of Pennsylvania decided that wolves were exotic pets, and that all owners of exotic pets needed a special permit in order to keep their pets. Of course the Darlington's applied for the permit. After receiving the permit to keep their wolves the Game Commission came to them to ask if they would consider letting them bring wolves to them instead of euthanizing them. And that was the beginning of the Wolf Sanctuary. Now more then 3 decades later the Sanctuary is still going strong. In 2007 the Sanctuary starting giving tours and educational programs in order to get more people to visit. Chuck Rineer the author of the book has been volunteering since 2007 at the sanctuary. He has done an amazing job with the photos in this book. Documenting these beautiful animals and sharing them with the world. I loved reading the stories and tidbits featuring the wolves by name. I would love to someday go and visit the sanctuary in person. I won this book as part of the Firstreads Giveaway program, it arrived promptly, I read it, and am now keen to visit the Wolf Sanctuary of PA upon which it focuses. Rineer is a volunteer at the Sanctuary, has taken thousands of photos of the packs housed there, and offers this book as part homage to these remarkable animals and to the work of the Darlington family that established the sanctuary and educational facility that provides food, shelter, and veterinary care to some 40 wolves and hybrid I won this book as part of the Firstreads Giveaway program, it arrived promptly, I read it, and am now keen to visit the Wolf Sanctuary of PA upon which it focuses. Rineer is a volunteer at the Sanctuary, has taken thousands of photos of the packs housed there, and offers this book as part homage to these remarkable animals and to the work of the Darlington family that established the sanctuary and educational facility that provides food, shelter, and veterinary care to some 40 wolves and hybrid wolf-dogs. Rineer's preface notes: "I've chosen photos that inspired me to learn more and hope it will do the same for you" (9). Mission accomplished, Mr. Rineer! I received this book from Edelweiss+ in exchange for an honest review. The highlight of this book is obviously the photos. You can tell that Chuck Rineer is a phenomenal photographer. He was able to show the personality of each wolf that he photographed. It was wonderful to experience those photos & I will have to follow his social media pages so that I don't go through withdrawal. I enjoyed the photographs but the writing was a bit bland. I would have loved to learn more about the wolves bu I received this book from Edelweiss+ in exchange for an honest review. The highlight of this book is obviously the photos. You can tell that Chuck Rineer is a phenomenal photographer. He was able to show the personality of each wolf that he photographed. It was wonderful to experience those photos & I will have to follow his social media pages so that I don't go through withdrawal. I enjoyed the photographs but the writing was a bit bland. I would have loved to learn more about the wolves but the writing didn't do the wolves justice. I received this gorgeous book through the Goodreads Giveaway program. I loved it! The photographs are amazing and the accompanying prose is wonderful. Anyone who loves wolves, or any wildlife, will want to add this book to their home. This volume would be perfect on the shelves of any library, personal or public, in order to appreciate these wonderful animals. I'm passing it along to my granddaughter, who has had a long love affair with these noble canines. Wolf Sanctuary by Chuck Rineer is a free NetGalley ebook that I read in mid-May. Subtitled 'the Wolves of Speedwell Forge,' photographer Rineer spends time at this Pennsylvania sanctuary and tells stories (visually and in text) about the staff, volunteers, the wolves, their personalities and behavior through seasons, creating dens, a generation of pups, and makes an extra effort to identify each by name. Filled with images of wolves at the Speedwell Sanctuary in Pennsylvania. A short but nice coffee table book. Good for animal lovers but just a bit short on narrative. Thanks to Net Galley for my copy. 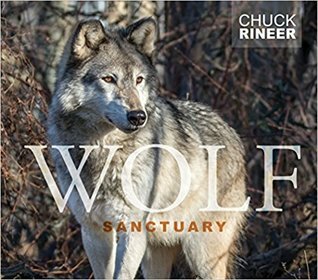 Wolf Sanctuary by Chuck Rineer is a dazzling compilation of photographs that the author took of the wolves at Wolf Sanctuary of PA, a preservation and education facility run by the Darlington family. There are ten chapters, each with brief written introductions, and full of stunning photos. While there is text at the beginning of each chapter, the bulk is devoted to these majestic beasties. The first chapter introduces the human element- the staff of Wolf Sanctuary. Other chapters focus on topics Wolf Sanctuary by Chuck Rineer is a dazzling compilation of photographs that the author took of the wolves at Wolf Sanctuary of PA, a preservation and education facility run by the Darlington family. There are ten chapters, each with brief written introductions, and full of stunning photos. While there is text at the beginning of each chapter, the bulk is devoted to these majestic beasties. The first chapter introduces the human element- the staff of Wolf Sanctuary. Other chapters focus on topics such as denning, pups, wolfsong, exercise/play, rest/relaxation, and feeding dynamics. It's easy to see the depth and complexity of not just the packs themselves, but of the individual wolves. My favourites were the pics of the pups, and of adults sleeping in the snow, though Thor was my favourite wolf. He's blind, which I can relate to. This is a perfect gift for any who love wolves, or nature photography in general, and would make a lovely coffee table book. Thanks to Netgalley, the publisher. and the author for allowing me to read and review a digital copy of this book. Stunning photographs of this beautiful animal fill this volume, along with a history of the sanctuary and facts about wolves. Educational and inspiring. Wolves are my favourite animals and this book captures the majestic nature of the wolves through the camara lens. This is predominantly a picture book, that is set out in chapters with I formative narratives. It is a fabulous insight into the behaviour of the Speedwell Forge Wolves through pictures. The pictures taken by the author Chuck Rineer are fantastic with great compensition which captures the individual personalities of the wolves. Anyone that enjoys looking at stunning pictures of majes Wolves are my favourite animals and this book captures the majestic nature of the wolves through the camara lens. This is predominantly a picture book, that is set out in chapters with I formative narratives. It is a fabulous insight into the behaviour of the Speedwell Forge Wolves through pictures. The pictures taken by the author Chuck Rineer are fantastic with great compensition which captures the individual personalities of the wolves. Anyone that enjoys looking at stunning pictures of majestic wolves and learning about then will love this book. I have been drawn to wolves for several years now, after having visited the Wolf Sanctuary in Ipswich Massachusetts, near where I live. I loved reading every page of this fascinating book, including all the many photos of the wolves from the Pennsylvania sanctuary. It was interesting to learn about how the wolves interact, create dens, and raise the pups. The photographs really brought me in to the stories of these beautiful creatures. Stunning photographs of this beautiful animal fill this volume, along with a history of the sanctuary and facts about wolves. Educational and inspiring. This is a gorgeous, stunning visual treat. To be allowed a glimpse of these wolves, a window into their lives is an experience most of us will never experience. This is one of those rare coffee-table-style books any wolf enthusiast will adore. And I plan on getting a copy for myself. We see the wolves resting, howling, eating, making a den and bringing up the pups in a combination of colour and black and white photographs. We feel as though we are there, and it was not hard to imagine the little This is a gorgeous, stunning visual treat. To be allowed a glimpse of these wolves, a window into their lives is an experience most of us will never experience. This is one of those rare coffee-table-style books any wolf enthusiast will adore. And I plan on getting a copy for myself. We see the wolves resting, howling, eating, making a den and bringing up the pups in a combination of colour and black and white photographs. We feel as though we are there, and it was not hard to imagine the little hairs on the back of my neck lifting with their howls. I have been fortunate to hear wolves howl in the wild as they hunted, so it didn't require too much imagination to hear these ones. The photographs of the wolves are absolutely beautiful. I appreciate the stories within the work, and love the mission of the sanctuary. I especially enjoyed the chapter on the wolves baying at the moon, it’s a subject that speaks volumes to me. An excellent, highly recommended, beautiful work. Absolutely beautiful book filled with educational information about the lives and behavior of wolves. The photographs are technically excellent, but so much more. They capture the setting and feel of the events perfectly. Not only did I enjoy viewing the photographs and learning about the Wolf Sanctuary of PA, I'm now inspired to pick up my camera again. This lovely book offers a beautifully photographed look at the Speedwell Forge Wolf Sanctuary in Pennsylvania. It is a photographic Valentine to these mysterious creatures by Chuck Rineer, who has photographed the packs in their natural habitat since 2007. Offers a peek into the hidden world of wolf life, including how new members become part of the pack and how they live in every season, along with stories and insights into pack behavior. Highly recommended! Thanks to the author, Schiffer Publishing Ltd. and NetGalley for the review copy. Opinions are mine. Wolf Sanctuary: The Wolves of Speedwell Forge by Chuck Rineer is both a photography collection and a non fiction book about the wolves of Speedwell Forge Wolf Sanctuary.It is currently scheduled for release on April 28 2018. Speedwell Forge Wolf Sanctuary is a refuge for displaced wolves in the rolling hills of Pennsylvania. Through the images readers can experience wolves at work and play, and encounter their howls and growls close up. Since 2007, Chuck Rineer has photographed the packs in their Wolf Sanctuary: The Wolves of Speedwell Forge by Chuck Rineer is both a photography collection and a non fiction book about the wolves of Speedwell Forge Wolf Sanctuary.It is currently scheduled for release on April 28 2018. Speedwell Forge Wolf Sanctuary is a refuge for displaced wolves in the rolling hills of Pennsylvania. Through the images readers can experience wolves at work and play, and encounter their howls and growls close up. Since 2007, Chuck Rineer has photographed the packs in their natural habitat, displaying a connection and respect for their way of life that few of us will experience. See the hidden details of wolf life, and go behind-the-scenes of this special sanctuary. Learn how the newest wolves are integrated into the packs, something rarely seen by human eyes, and follow all the wolves through the different seasons of the year. Full of stunning photographs, stories, and insights into pack behavior, this is a must-have book for those who have been captivated by wolves from afar and long for the chance to see these majestic animals up close and personal.